Rey always stands up for what she believes in, and BB-8 is a feisty, loyal droid. After becoming close friends on the desert world Jakku, they stick together no matter what. 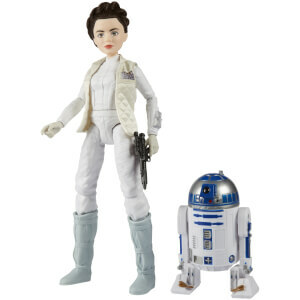 Imagine epic adventures as they journey across the galaxy searching for the legendary Jedi Luke Skywalker with this Star Wars Forces of Destiny Rey of Jakku adventure figure with BB-8 friend. This highly poseable figure features beautiful rooted hair, and a vest, boots, belt, arm wraps, and skirt she can be dressed in. When they face danger, place Rey's lightsaber in the figure's hand and squeeze her legs to see her strike! Re-create the battles and stories of Star Wars with these true-to-entertainment companions.